I’ve bought (or considered buying) a lot of collapsible travel bowls. Most are just too darned big — Chloe will never weigh much more than 13 lbs., and she eats maybe a half cup of food at a time and only laps briefly at her water. She just doesn’t need a 2.5 qt. bowl. Other collapsible bowls, with more reasonably sized bases, are too deep — she doesn’t want to stick her head into a dark well to reach the modest amount of food or water she needs — but you can sometimes get around that problem by folding the rim of the bowl over. The one that has worked best for us is Canine Hardware’s Hydro Bowl. Folded, it’s small enough to fit in my purse or a pocket. Unfolded, it’s sturdy enough to stay reliably upright, it’s shallow, and its opening is wide and holds its shape pretty well. (Chloe gets spooked when her bowls close their jaws shut on her muzzle.) It’s also definitely waterproof. The other one we use, Bison Design’s Fold-a-bowl, is deeper, but not too bad; after it has held water for a few hours, though, it feels damp. We use it for food instead. I jeered at dogs wearing booties, until the day we found ourselves stranded in NYC by a winter storm. Chloe frolicked out into the snow, but as soon as she hit the salted sidewalk (and I mean within a second or two) she started crying with pain and tried to lift all four paws off the ground at once. 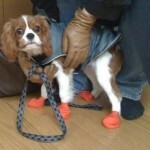 Happily, there was a pet store nearby selling these disposable rubber booties. She was initially dismayed, as you can see, but after only a few steps learned to ignore them. I’ve contemplated buying her real boots, but these are thin enough to give her good traction and allow her to feel the ground beneath her paws. And the disposable part is great — after a morning on NYC streets and in the dog park at Union Square, her feet were filthy and I was happy to toss her booties in the trash. This is not my idea, but it’s brilliant. Petco and PetSmart both have machines that allow you to make, quickly and cheaply, an ID tag for your dog’s collar. Before you leave for a trip, make a tag showing the address where you will be, including a local telephone number, and clip it onto your dog’s collar with her regular ID tag. That way, if your Seattle-based dog is lost while you’re traveling in Southern California, the person who finds her in Long Beach will be able to reach you right away. Traveling to more than one address? Make more than one tag — they’re pretty cheap. Half of my car’s back seat is occupied by Chloe’s Snoozer (medium) Lookout Model I, which she and I both like. It’s too bulky to travel with, however, and for trips where we plan to rent or travel in a car, I pack a safety harness for her. Finding one that worked, however, took some doing. I first bought a CanineFriendly 3-in-1 vest harness, and while I liked the harness part (padded with fleece and sturdy but not weighty), it gave Chloe no slack to lie down. The seat belt passes through a slot in the harness itself, and Chloe only weighs 10 lbs., so she was pretty much pinned by the middle of her back to the seat back of the right rear seat. She could only be comfortable if I pulled a length of seat belt out and trapped it behind the flip-down armrest which, of course, largely defeated the goal of ensuring her safety in an accident. The CanineFriendly product is not alone — the Ruff Rider Roadie is another example of a good-looking car safety harness that just won’t work for a small, light dog. On the other hand, Watson’s Canine Seat Belt Harness is just the ticket, with an attached strap that allows some movement — but it’s meant only for dogs 20 lbs. and up. Happily the CanineFriendly vest harness also includes a sturdy D-ring. (It’s meant to allow the harness to be used with a leash, but I think it’s too chunky a harness for everyday use. 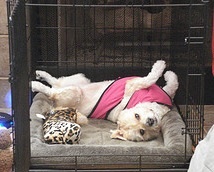 Chloe’s normal harness is the light, mesh Airness harness from PetEgo.) I ended up buying a PetBuckle seat belt harness kit and using the strap from it with the CanineFriendly vest (the PetBuckle harness, though allegedly for dogs 10 lbs. and up, is incredibly heavy). The strap is beautifully sturdy and has a connector that clicks onto the latch bars people normally use for child seats (there is also an adapter through which the seat belt can pass). The combination gives Chloe some range of motion, but is certainly sturdy enough to protect her. It was expensive, however, buying two products and combining them to create my ideal product. If I was starting all over again, I think I’d try ordering Snoozer’s product, the Snoozer Super Safety Dog Car Harness, which I’ve only seen in pictures. The vest portion looks substantial but not cripplingly heavy, and the strap would appear to allow a small dog to lie on its side. I’m also intrigued by Hunter K9 Gear’s Pet Vehicle Harness, which looks nicely-designed and is more reasonably priced. I am not enthused about another Hunter K9 Gear product, the Pet Seat Belt with Strap, though it is very reasonably priced. I worry that a serious crash would be too much for the plastic quick-release buckles, and the narrow straps don’t pad and cradle the chest the way other products I’ve mentioned do. I would also not rig up a solution using your dog’s everyday harness and leash, since the stitching and hardware on these products are not designed to stand up to the force of a car crash.